You have looked at the hundreds of designs on our website. You have flipped through our catalog. Still can't find something you like? Don't give up! 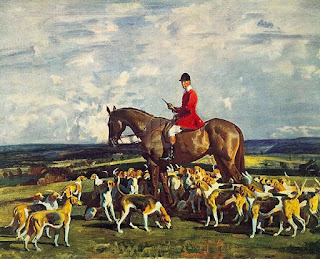 We have arrangements with two prominent art licensing companies. 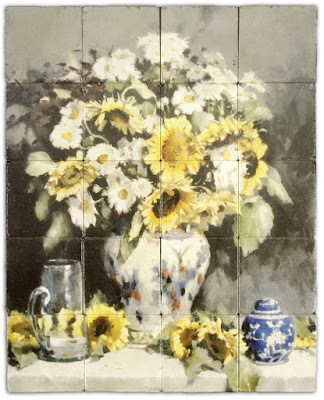 You can browse their websites and pick out artwork to create a custom design for your mural on our natural stone tiles. Both website have terrific search features that allow you to narrow down the choices and find the perfect design. Wild Wings lets you search by Season - Spring, Summer, Fall or Winter. Rosenstiels has an advanced search option which lets you filter by colors that you want to see in your search results. 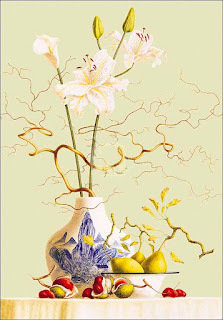 Found by searching for "Flowers" and the color white. Step 2: Go to your local StoneImpressions Dealer and place your order. 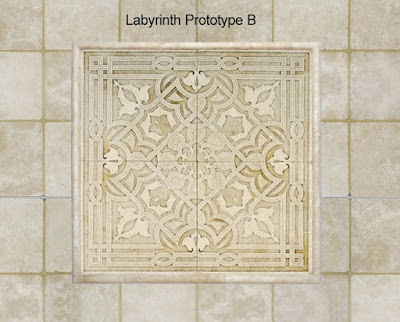 They can help you decide what size mural to order and what type of stone to put it on. 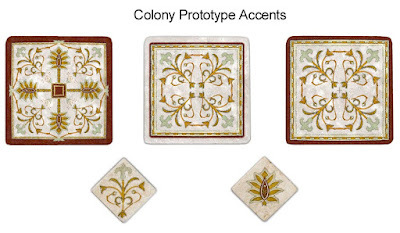 They can also help you pick out liners or trim pieces to frame your tile mural. Keep in mind that we can also create a custom design from a photo that you supply to us. You can find more information about our Custom Program here: StoneImpressions Custom Design. 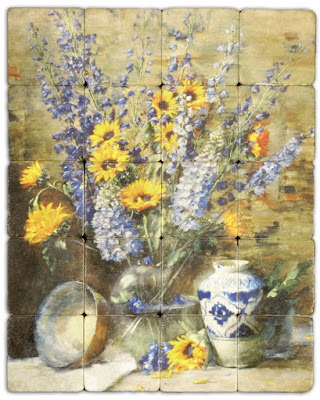 Nadine from Dobkin Tile in Albany, NY sent us some pictures of a kitchen backsplash mural that they created using our GG200218 Elegante design. 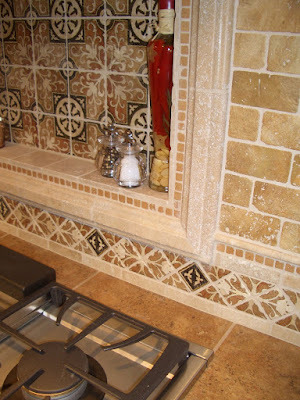 They used the beautiful Elegante mural 12" high by 30" wide on 6x6 Tumbled Durango and surrounded it with Cercan Light Brown Mix of Glass and Stone mosaic. 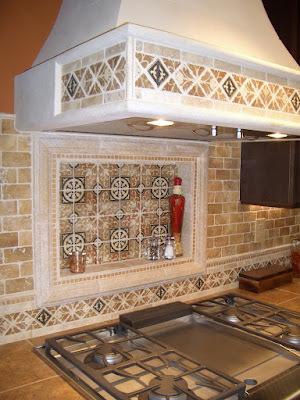 It is framed with our Durango Dome Liners and the rest of the kitchen backsplash uses our 4x4 Tumbled Durango field tile. The Elegante design has always been one of the underappreciated gems in our collection. We'll write more about this later. 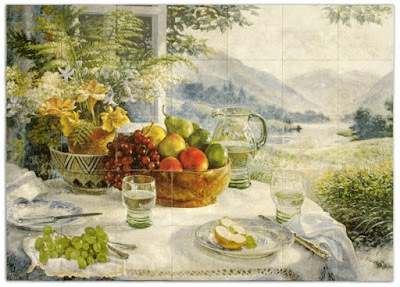 Click here to see the Elegante mural on our website. Click here for Dome Liner. 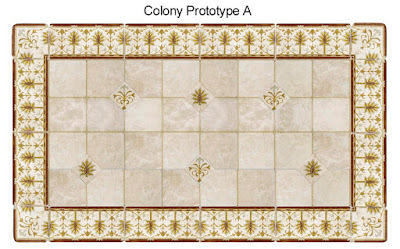 Click here for Durango Field Tile. Here's a preview of some new mural prototypes we are considering. Let us know what you think! Click on the Comments tag below this post to give us your feedback. but look at the great things we can find! This Friday we have only one item to share with you, because once you click on the link, you'll want to spend hours and hours over there. The website is called Houzz and it allows you to browse through thousands of photographs of homes and rooms - both indoor and outdoor spaces. The best part is that you can create your own Ideabooks and save all of the photos that you like. You can even email your Ideabooks to your family, friends or professionals. It is the digital equivalent of tearing out pictures from magazines and throwing them all in a folder. But much, much cooler, way more organized and thankfully less expensive - it's free! Just for fun, we created our own Ideabook to share. Autumn is here, but it was 82 degrees today in San Diego. We are thinking cozy and warm, but outdoor cozy works best here. Settling down on a cool night in front of one of these fireplaces with our neglected loved ones, a fine wine in our dirty glasses and the hungry dog curled at our feet. What more could we ask for? Dundee is the office dog. 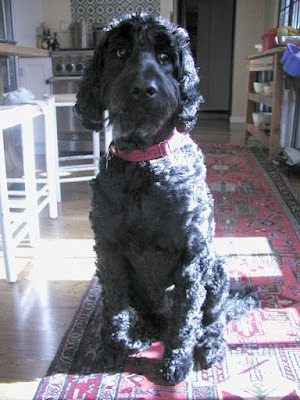 He's a Labradoodle - half Lab, half Poodle - and is 77 pounds of doggie fun. This picture shows him after a summer haircut. That is why he's looking embarrassed. We love it when he puts his slimy, disgusting tennis ball on our desks and then patiently waits for us to throw it. Abraham is the office / production dog. He is of that noble breed "Mutt" and was a rescue dog. 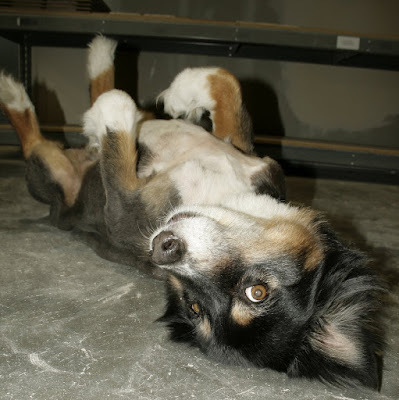 He loves to follow Ruppert around all day long and as soon as you start to pet him, he rolls over hoping for a belly rub. Who can resist? Once again, we give you a sneak peek into a couple of new designs that we are developing. We'd love to hear what you think! After looking at the pictures, give us your feedback by clicking on the Comments tag below this post. 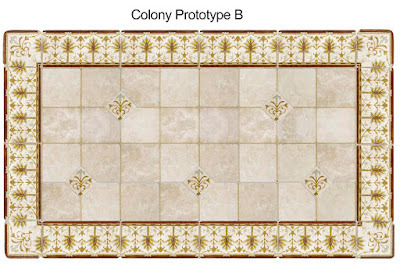 You think that this design is so amazing, you are going to start demo on your house right this minute, just so you'll have an excuse to use some of our tile. You can't stand to look at it and you are going to fly to San Diego today, just so you can come into our Design Department and smash all of these tiles to pieces. Where do you see these designs working? In your jail cell, after you have come to smash our tiles? What color choices would you like to see us offer for these designs? We have a great deal of flexibility with color, so almost anything is possible. And give us as much "I like this, but...." as you want. Click on any picture below to get a larger view. You will definitely want to click on these pictures to see a detailed view of the design. Let us know what you think by clicking on the Comments tag below this post. Altera Design & Remodeling in Walnut Creek, CA just sent us some pictures of a beautiful kitchen display that they did in their showroom. Click on the pictures below for a larger view. 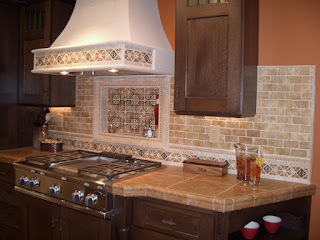 They used our classic Amaretti Earth Pattern in the center backsplash and framed it with Double Ogee Listels. 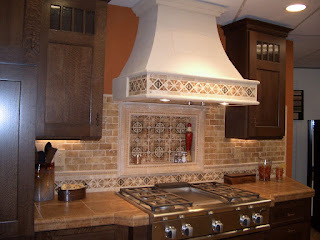 The Amaretti Earth Deco Strip runs along the bottom of the backsplash and across the hood. The Terra Cotta Color Wash on 3x6's is laid out in a subway pattern to fill the rest of the backsplash, with Pencil Liners between the Deco Strip and the 3x6's. Click here to see the Amaretti Collection on our website. Click here for Color Wash. Click here for Pencil Liner and Double Ogee.